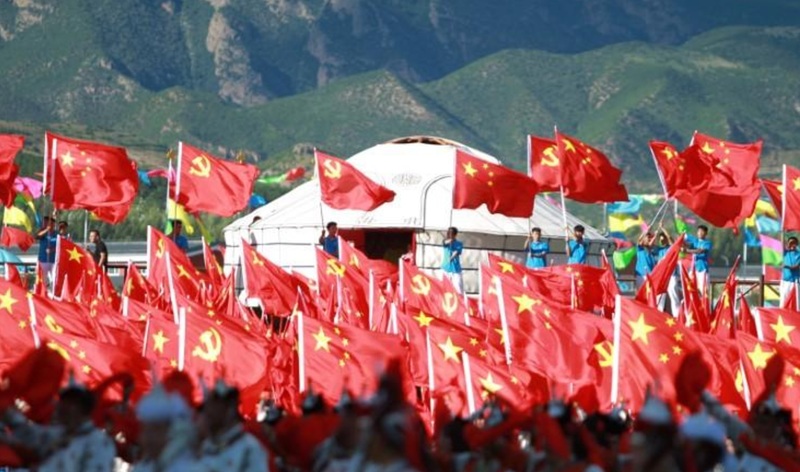 China on Tuesday celebrated 70 years since the founding of Inner Mongolia, its first self-proclaimed region run by ethnic minorities, as a leading Mongol activist said her communications had been interrupted and the police were following her. China’s Communists set up Inner Mongolia in 1947, two years before seizing power at the end of the country’s civil war. It has served as a model for other “autonomous regions” with large minority populations, like Tibet and Xinjiang. The regions are meant to have a high degree of self-government, but dissidents and rights groups say in practice the majority Han Chinese run the show, keeping a tight rein, fearful of unrest in the strategic border locations. The “glorious achievements” of the past 70 years resulted from the correct leadership of the ruling Communist Party, said Yu Zhengsheng, its fourth-ranked leader. “Ethnic unity is the lifeline for all our country’s nationalities, and strengthening ethnic unity is a strategic, basic and long-term task,” Yu said during a live broadcast of celebrations in the Inner Mongolian capital of Hohhot. Conditions must be created for different ethnic groups to live, study, work and be happy together, he told the audience in an outdoor stadium where the festivities were held. Inner Mongolia, China’s largest coal producing region, has seen sporadic unrest since 2011, when it was rocked by protests after an ethnic Mongol herder was killed by a truck after taking part in demonstrations against pollution caused by a coal mine. Some Mongols, who make up less than a fifth of the 24 million population of Inner Mongolia, say their grazing lands have been ruined by mining and desertification and the government has forced them to resettle in permanent houses. Xinna, the wife of China’s best-known Mongol dissident, Hada, told Reuters that plainclothes police officers had parked outside her Hohhot home, followed her when she tried to go out and her internet access had been interrupted ahead of the anniversary. “Today is not a day to be happy but to be depressed,” she added. Many Mongols in China go by a single name. Hada, who had been one of China’s longest-serving political prisoners, was freed in 2014 after being jailed in 1996 for separatism and spying, charges his family say were punishment for speaking out about the threatened Mongol culture. The government in Inner Mongolia did not answer telephone calls to seek comment. Hohhot police declined comment.